“The average attention span for the notoriously ill-focused goldfish is nine seconds." Humans have very short attention spans. That is for sure. (What was I writing about??? Oh yeah…) Thanks to amazing distractions known as the smart phones and the internet, it's getting harder than ever for humans to focus on one thing at a time. In marketing, attention span has a significant impact on content consumption and especially video effectiveness. Videos are one of the most powerful mediums available to tell your company’s many wonderful stories. I believe that if you are able to simplify and clarify your message and create powerful stories where your customer is the “hero” of the story, you can break through the marketing “noise” in the marketplace and significantly influence your target customers to take your desired action. What I just described it the essence of the word “engagement.” That is a word we hear often in marketing and especially on social media channels like Facebook. There you have it. That’s all you need to know. But if you’d like to know more, please read on. 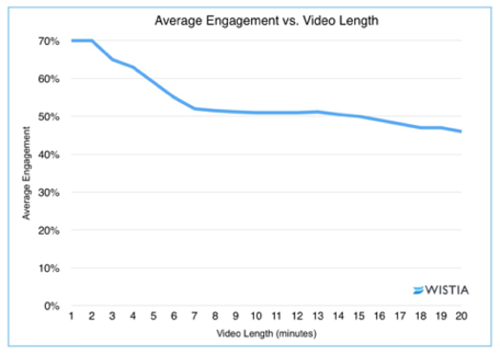 Because every video is a different length, we decided to explore length versus engagement. Their team expected engagement to decrease with video length. In other words, we would expect people to watch more of a one minute video than a two-minute video. But they also imagined that increasing a video from one minute to two minutes-a difference of one minute, but 100 percent longer-would have a much bigger impact on engagement than the jump from 10 minutes to 11 minutes-a change of one minute, but just 10 percent. Luckily, we have plenty of data to draw from. Their team looked at 564,710 videos and more than 1.3 billion plays for this research, so they felt comfortable that the results are representative of wider video engagement trends. So what did this data actually tell us? Takeaway: Short and sweet is a safe strategy. Assume that your viewers are busy. But don't sweat over a few seconds here and there if you're still going to come in under the two-minute mark. There is significant drop-off between two and three minutes. After two minutes, every second counts. Takeaway: If you're new to video, start with short videos under two minutes. This will help you get a feel for what resonates with your audience before you invest in longer content. Takeaway: Beyond two minutes, focus entirely on the content. If the viewer would benefit from brevity, go short. If they'd benefit from depth, don't cut just for the sake of cutting. My Takeaway: Focus on producing marketing videos that are compelling that create emotional resonance with the viewer that explain the essence of the product or service you’re marketing, and your viewership and engagement will follow. Also, keep in mind that social media algorithms are changing constantly. I hope this inspires and encourages you to think about the way your company is utilizing marketing videos. You have a unique story to tell. I encourage you to start creating video content on your website and social media channels. Experiment and see what works best for your business. And be sure to focus on the Hero of the story being your customer — not you.